Q8230 is an handheld optical power meter for the optical storage and sensor market. In conjunction with 3 optical sensor power heads – models Q82311, Q82312 and Q82313 - it covers the visible and near IR wavelength range from 390 nm to 1110 nm. 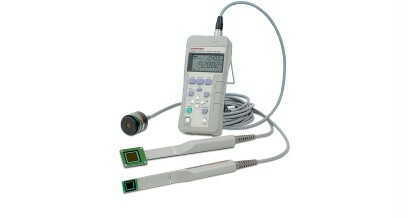 Q8230 is an handheld optical power meter for the optical storage and sensor market. In conjunction with 3 optical sensor power heads – models Q82311, Q82312 and Q82313 - it covers the visible and near IR wavelength range from 390 nm to 1110 nm. Thanks to stringent calibration throughout, the power meter can be used in the entire wavelength range with 1 nm correction steps. The extremely flat sensors facilitate measurements of the light beam in tight spaces, eg of optical disks (CD and DVD pickups). All 3 sensors show a very low incident angle dependency, which allows high numerical apertures (NA) for the pickups. The sensitivity is as good as -60 dBm and the high power sensor covers a range up to 200 mW. At low levels an averaging function with up to 20 average values an dalternativley a smoothing function ensures reliable measurement. The necessary zero adjustment is made automatically with the sensor darkened. A Max Hold function allows accurate power measurement even of test setups that are difficult to adjust and highly instable. An USB output is provided for data transfer to a PC and additionally an analog output for recording the measurements. For even more detailed signal evaluation an optical spectrum analyzer for that wavelength range can be used, model Q8341. compared with the former model TQ8210 it features many improvements like higher accuracy with a 2.5 % error, a 5 1/2 -digit display, higher sampling speed, 1 nm step wavelength correction, 60 hours battery operation and USB interface. The power head Q82017A of the TQ8210 is not compatible with Q8230 and has been replaced by model Q82311. Other flat-type sensors with higher power rates are available too.